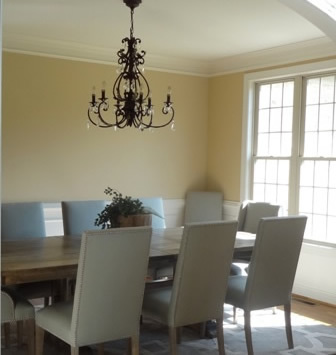 We made custom linen drapes for this Winston Salem, NC home. We used silver hardware to compliment our silver leaf chandelier. Notice we hung the drapes outside the window, which made the room look wider! This project was for a mother of three, she loves our in home viewing service, which allows viewing our designer fabrics in the convenience of your home. It's much easier to visualize when the fabrics are spread out in the actual room, as lighting and flooring can change the color tone! We also provided the narrow server, since the homeowners couldn't find one that was narrow enough in furniture stores. For the final touch, we found the beautiful gray rug, which compliments the gray Sherwin Williams wall paint. 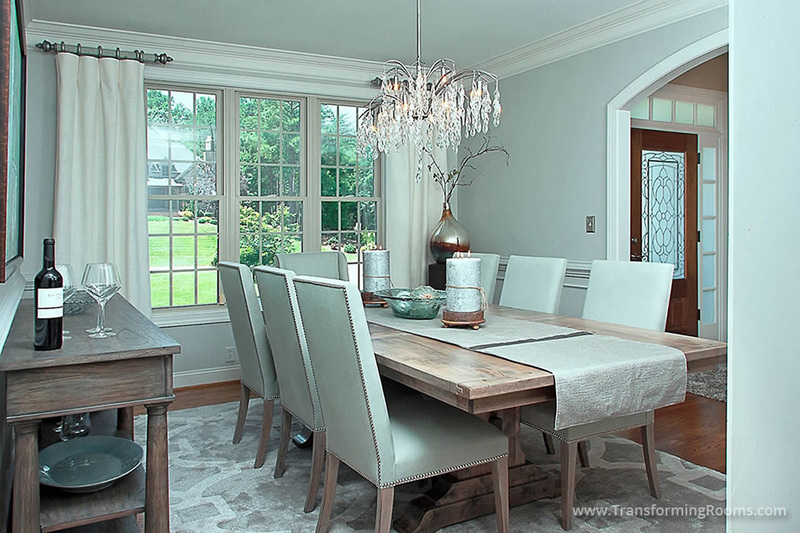 This dining room is now the glamorous room they desired!